I just love reporting about new smartphones. Huawei gifted Australia with a new mobile phone known as the Huawei U8300, tagged as a cheap pre-paid Android solution. The Android powered smartphone is made available via Australian telecom giant, Boost Mobile. 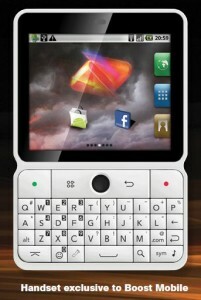 On first-look, the Huawei U8300 more looked like a Gameboy or Nintendo possessing a wide screen and QWERTY keyboard. Huawei’s new handset is powered by Google’s powerful Android 2.1 Operating System. Android seems to have become one of the largest and most successful Operating System to power the handsets. Furthermore, the U8300 brings out a display of 2.6-inch LCD Touchscreen boasting a display of 240 x 320 pixels. Although it does support almost all the features which a smartphone consist these days, the price has been tagged really low, due to the screen being small and being resistive. Users need to press harder in order to make the touchscreen work. Boost Mobile has made the new smartphone available at a price of $149 on a pre-pay basis, which makes it the cheapest Android-based smartphone on the market in Australia. Furthermore, the new device includes a 1GB MicroSD Card and a reader. The handset possess a 930mAh Lithium-ion battery.